Have you got Sunday 6th March noted in your diaries? If not, perhaps you should, as it’s Mothering Sunday, the one day a year our beloved mums get time to put their feet up and enjoy a day of blessing. Although you should be grateful for your dear mother all year round, sometimes unfortunately, life gets in the way of visits and phone calls – but when you’re all grown up its important to remember the person that helped to get you there. It’s difficult sometimes to pinpoint one present that says “Thanks Mum” without it being cliché and whilst our supermarkets stock their shelves with sweet mother’s day related confectionery, balloons and stuffed animals, you’re no longer a clueless ten-year-old. Although, despite the fact you’ve left home and you’re now official an adult, you may still be clueless. But with a wave of a magic wand your Fairy Godmother (that’s me) shall disperse any qualms you have over what to gift the woman who sat up every night reading you Cinderella as a baby. Fingerprint Jewellery is a unique and enchanting way to encompass all your love, sentiment, individuality and at the same time, look breathtakingly stunning. 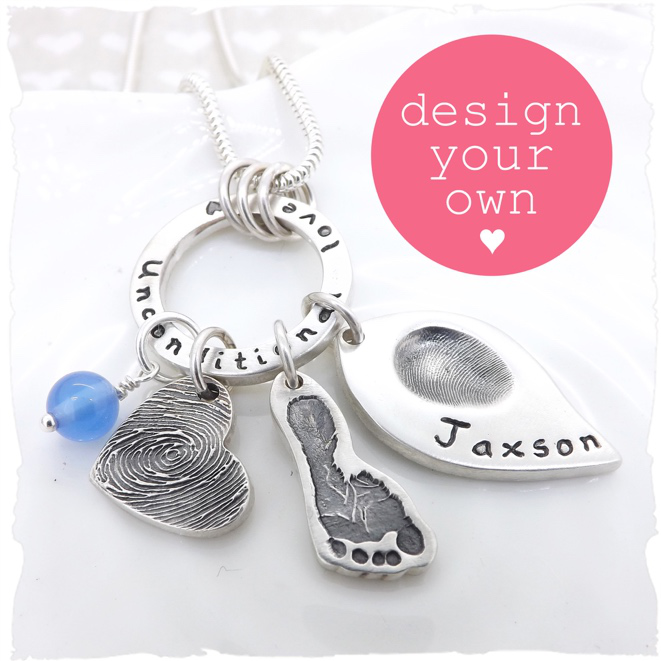 Family run company Hold Upon Heart create beautiful fine jewellery with your loved one’s fingerprints, handprints, footprints and paw prints engraved onto rings, necklaces, cufflinks, bracelets, key rings and charms. The website has so many designs its difficult to choose from, but every item can be customised to make it personal to you and the lucky person you are gifting. Once you’ve found your desired design you are sent a Print kit through the post which allows you to make copies of prints or even send in a portrait, drawing or signature to be embossed onto your chosen piece. It’s really straight forward and the results are amazing. 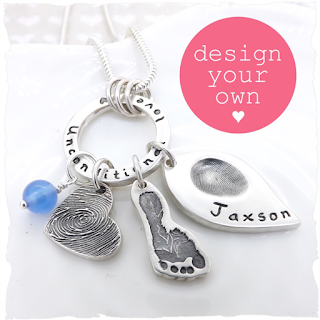 You also have the choice to add additional beads, charms, dates, names and birthstones. a lovely way to encapsulate mine and my brother’s handprints, birthstones and then we had ‘to the moon’ etched into the cluster ring – an inside phrase which I know will leave my mum in tears of joy (she cries at anything remotely sentimental, it’s cute). The whole process is really enjoyable as the creation of the prints gave me and my brother an excuse to have some sacred and rare bonding time. We ended up reminiscing about our childhood, discussing all the cheeky childish things we used to do and try and get away with! I know my mum will adore the necklace and the sentiment it holds dear to her heart. I’m already planning on creating a bracelet for my Granny when it comes up to her big seven-zero this year (she doesn’t like telling people her age, it’s considered a felony to even mention her birthday). So that’s two difficult, hard to buy for people sorted this year. What did I tell you? 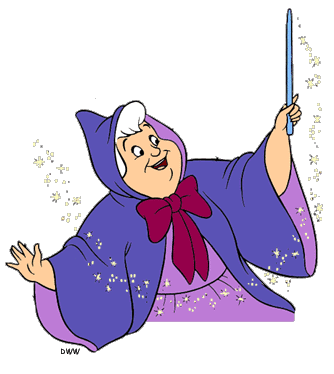 BIBBETY-BOBBETY-BOO!